Another one of the summertime critters that I am looking forward to seeing soon. 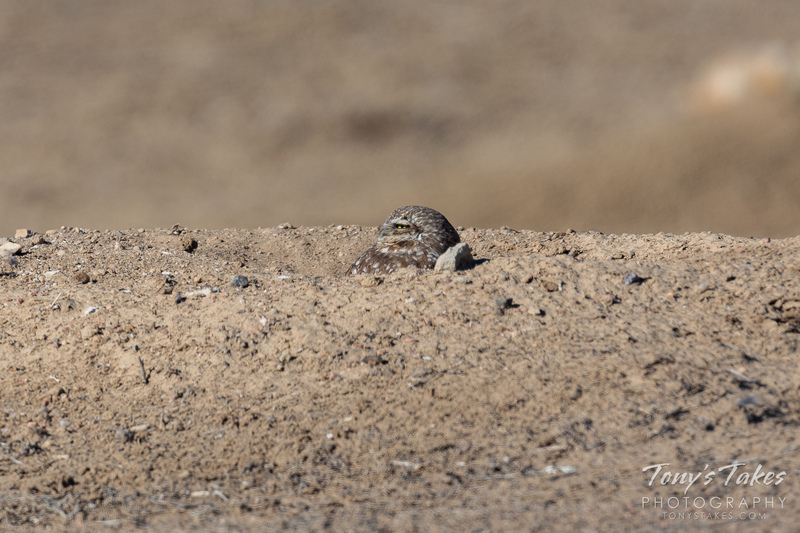 Usually I see the burrowing owls return to the Colorado plains during the first couple of weeks of April. That time of year, snow is not out of the question here and I suspect that sometimes that catches the little guys off guard. 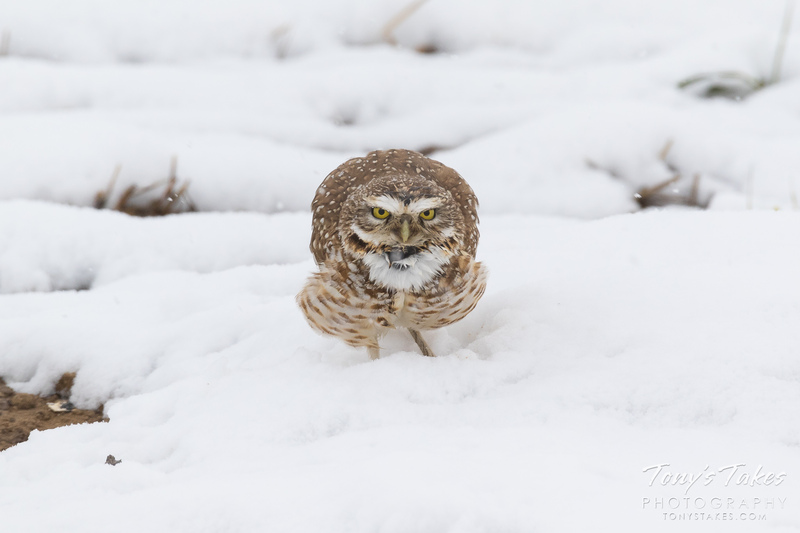 This image was taken last year and was the first owl of the season I had seen. We had just received a nice shot of snow and as I was driving, I see it hanging out right next to the road. It was quite patient and not the least bit bothered by me. The owl even gave me some nice calls which is what it was doing when this image was taken. These four Burrowing Owl owlets were quite animated on this morning a couple weeks ago. No, they weren’t really chatting about the neighboring rodents. They were however getting very close to flying and there was a lot of wing flapping going on. Here, one was testing out those wings while three of its siblings looked on. A couple of very busy parents here with five little ones to take care of. I spent hours watching them this past Wednesday and had an absolute blast. Here, mom had just taken the latest catch from the dad and was getting ready to take it to the kiddos. I think this little one was a bit surprised to have company early in the morning out in the middle of the Colorado plains. Two, minor county roads intersected the spot and it likely doesn’t get much traffic other than ranchers and perhaps someone like me looking for critters. A brief, early morning rain shower had dampened things and the owl’s feathers as well. The light was a bit dim as the sun was still rising and it was overcast making for a bit of a tough shot. 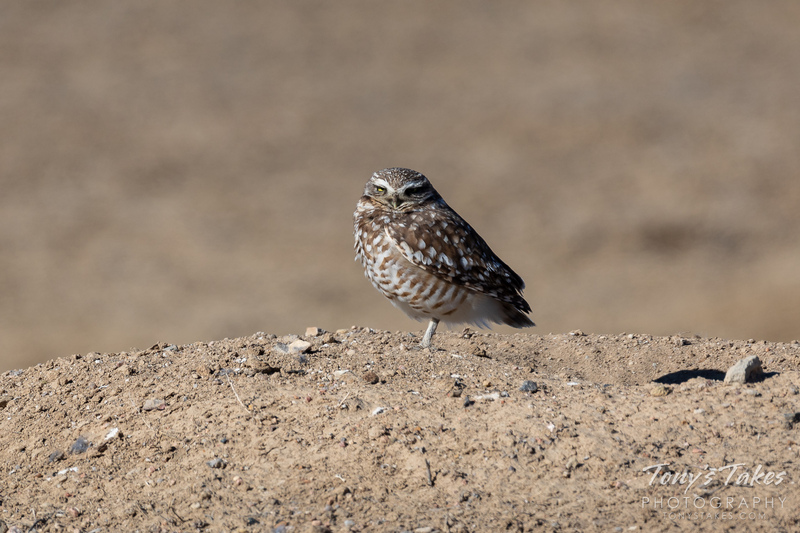 Thankfully the Burrowing Owl stayed put just long enough for me to grab a few shots. Well, these images were taken on Mother’s Day so I reckon perhaps in a way it is fitting that this pair was working on making babies. 😉 The pair was initially perched on two separate burrows. The female came flying in and that seemed to be all the invitation the male needed to initiate the intimacy. With any luck, the pair was successful but it will be several weeks before any potential little ones make a public appearance. Oddly enough, this seems to be – at least for me – a bit of a down year for Burrowing Owls. The majority of the usual spots where I have seen them in recent years have no activity or did once and have not since. It could just be a bit of bad luck / bad timing for me seeing them. But, in general, I am seeing far fewer pictures of them in my Colorado photo groups than what I would normal expect. See more pics of these cool little guys that I have taken in the past here. My first one of these of the season and he / she was quite an entertaining one. I had been on the lookout for them as I knew they had been migrating here as they do this time of year but wasn’t having much luck. As I drove along I glanced to my left and there it was, not 10 feet from the road. It gave me some awesome, closeup poses but, when a trash truck came by, it got scared and fled to the top of a hill. There, it played this game of sticking its head up above the snow-covered hill, checking to see if it was clear. Pretty funny to watch! In many ways, this is a fitting image to share on Earth Day. Burrowing Owls are considered a threatened species here in the Colorado. Their numbers appear to be on the decline as humans take over and destroy their habitat. Many folks think nothing of wiping out Prairie Dog colonies, a keystone species itself, but don’t realize the cascading effects of that on all of the other creatures down the line, including these little guys. Without the Prairie Dog burrows, Burrowing Owls don’t have a home and many other creatures like hawks and eagles don’t have a food source. On my tour of the plains yesterday I was sure I would see my ‘first of the season’ of these cool little guys but I came up empty despite checking 10 different usual hot spots. I have no doubt though that they are out there and those spots will soon have their summer residents. This image was taken almost exactly one year ago on April 9, 2017. During the summer Burrowing Owls can be found across much of the western United States. At more southern latitudes closer to Mexico and in Florida they stay in place year round. 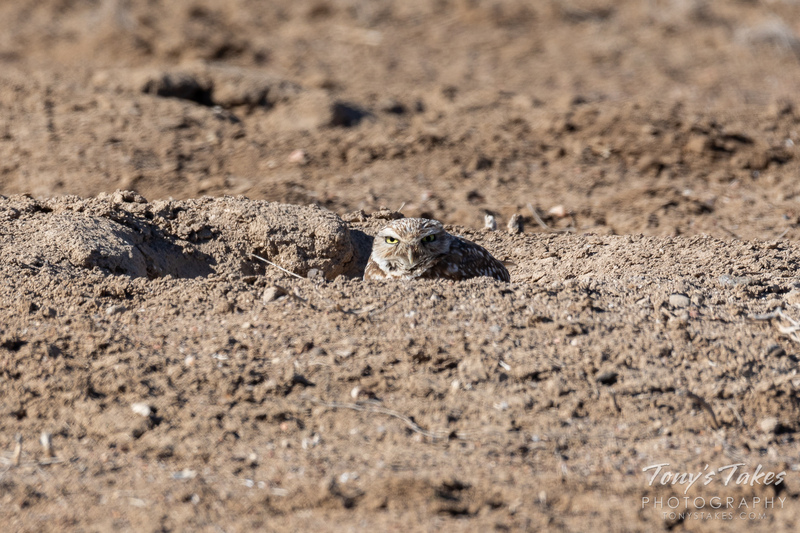 Unlike most owls, Burrowing Owls are diurnal (versus nocturnal) so it is quite common to find them out and about during the day. Burrowing Owls are considered a threatened species here in the Colorado. Their numbers appear to be on the decline as humans take over and destroy their habitat. Many folks think nothing of wiping out Prairie Dog colonies, a keystone species itself, but don’t think of the cascading effects of that on all of the other creatures down the line, including these little guys.